One of the great side benefits of working at a radio station is the regular availability of free food. I almost don’t want to do a post on this because somehow, some corporate boss is going to read about it and a no free food edict will result. Every so often, some local deli or pizza place will drop off something for the air staff. Usually, it is a friend of a friend and nothing nefarious is going on. When it arrives, the odor of good things to eat wafts through the building. With the smell of blood in the water, the sharks swim out of the sales bullpen and a feeding frenzy develops. Just watch out for your fingers, during the scrum, it is difficult to tell the difference between a digit and a sausage. 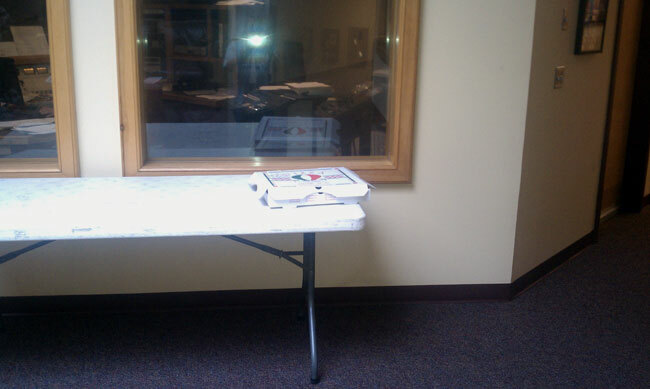 It goes fast, when I walked by this table 15 minutes ago, there were five full pizza boxes, just delivered. Now there is one box with two slices of some meat lovers heart attack special.